Thomas Boghardt has a piece called “Operation INFEKTION: Soviet Bloc Intelligence and its AIDs Disinformation Campaign.” This fascinating article recounts the back story of the ridiculous but widely believed claim that the U.S. Government developed the AIDs virus in a lab at Ft. Detrick in Maryland. I would particularly recommend this article to people interested in the FM 30-31B deception which has most recently fooled Daniele Ganser and the Parallel History Project. Terrence J. Finnegan has an article entitled “Military Intelligence at the Front, 1914-1918.” This is a topic of particular interest to me as I am presently finishing up a dissertation on American intelligence during World War I. I have yet to read the article yet, but I have high hopes as Finnegan’s recent book Shooting the Front: Allied Aerial Reconnaissance and Photographic Interpretation on the Western Front – World War I is brilliant, not to mention well illustrated and a joy to look at. Amusingly, Thomas Boghardt reviewed Finnegan’s book in an earlier issue of Studies. Finally, David Robarge, the Chief of the CIA’s History Staff, has a fine review article carefully weighing the various books, films, etc. that have grappled with the enigma/hero/walking disaster that was James Angleton. And yesterday I picked up a copy of Professor Alfred W. McCoy’s 2009 book, Policy America’s Empire: The United States, the Philippines, and the Rise of the Surveillance State. McCoy seems to have an extensive discussion of American intelligence operations in the context of the Spanish-American War and the Philippine War. Based purely on a quick read of the introduction, McCoy seems to argue, like Joan Jensen, that what the United States learned in these conflicts about conducting surveillance and intelligence operations it took home and also applied elsewhere. As I say, I haven’t read the book yet, but the History News Network had a positive review of it last fall. Mind you, McCoy has done extensive work on the role of the CIA in the international narcotics trade, so I’m going to approach this work with caution. We shall see. The Jihadi media institute “Mufakkirat al-Faluja: the Department of History and Strategic Recommendations” has published a book titled “In the Shadow of the Swords: From the Battle of Badr… to the Badr Invasion in Riyadh, Military Insight from the Depth of History” (193 pages), by Abdullah al-Hajj. Perhaps my wish for a new military thinker in the jihadist world has been answered? Will the War on Terrorism Be a Touchstone for Future Military Thinking? Throughout Western history there have been a series of periods or wars which have set the intellectual tone in military studies, be they works of theory or history. For many centuries the touchstone was the classical period of ancient Greece and ancient Rome. For instance, Vegetius’ De Rei Militari, for instance, was in active use all the way into the 17th century. 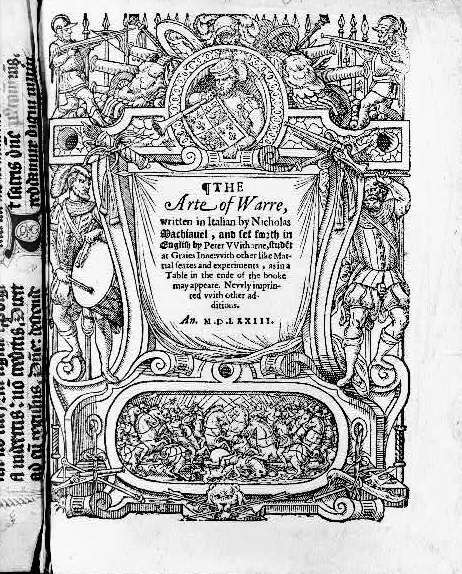 When Machiavelli wrote his Art of War in the early 16th century, he famously denigrated the utility of artillery so that he could make his recommendations conform more closely to the classical model. Eventually, new thinking started to emerge and there was a period during which there was no obvious touchstone and then came Napoleon who dramatically and repeatedly swept across Europe. Not only did Napoleon write his widely read Maxims, but, far more importantly Jomini and Clausewitz wrote their highly influential works basically to understand what Napoleon had done and this is not to mention the flurry of lesser works devoted to the same topic. Nor yet does it address all the works that built on Jomini and (to a much lesser degree) Clausewitz. By the time World War I came around, Jomini and Clausewitz were certainly still very important, but other things had happened, notably the Prussian wars against Denmark, Austria, and France, that got people’s brains churning, as well, and arguably there was no single intellectually dominant military event. World War I, however, became a dominant event and, not surprisingly, a great of the post-war literature focused on how we could avoid doing that again. This was a period of great intellectual ferment. Basil H. Liddell Hart’s concept of “indirect strategy” came out of this period, for instance. World War II then happened and, not surprisingly, dominated people’s attention for decades. After the war was over, the U.S. Army enlisted the help of German generals in helping it think about how to defend against the Soviet Army. Much of the agony of the Vietnam war boiled down to griping (whether well-founded or not is beside the point) that generals whose heads were in World War II were running the war inappropriately. In the Soviet Union, the history of the “Great Patriotic War,” as they knew World War II was even more dominant. Because criticizing current doctrine was a dicey proposition, Soviet officers writing in professional journals would often discuss current issues in the guise of debating history. Well, now we are in what used to be called the “Global War on Terrorism.” With the direct intellectual influence of World War II fading, will this current struggle become a well-spring of thinking in the future? If so, what will that future thinking look like? Or, alternately, will it sink like a stone, intellectually speaking? The United States does have a tradition of suppressing the memory of conflicts that fit outside of what it wanted to do. It did this to the Philippines War (once known as the Philippine Insurrection) and did it again to the Vietnam War. The Soviets, despite having fought Basmachi rebels during the 1920s and Afghan “dushmen” during the 1980s, kept its attention firmly focused on replaying World War II, except this time with nuclear weapons. If this global struggle doesn’t stick in the brains of strategists and military historians, what will? The Library of Congress has online a collection of motion pictures documenting the Spanish-American War, a part of its “digital collections” section. These brief movies are all from the period. Three or four are re-enactments (and the LOC carefully labels them as such) the rest are the real thing. That said, cameras were clumsy then and cameramen disinclined to expose themselves to gunfire, so don’t expect combat footage. Until I stumbled across this, I was not aware that there were any motion pictures of that war. I think you’ll find them interesting.